This video bundle further your knowledge of Cisco ACI into more advanced features and configurations. Those that are already familiar with ACI and are seeking more specific uses-cases or trying to make the most out of their current ACI deployment can use this bundle as guidance. Please note that this bundle is not meant to be an introduction to ACI. If you are new to Cisco ACI and would like to learn fundamental of the technology, please refer to our Cisco ACI (Basic) video bundle. 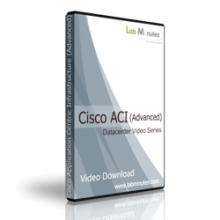 This video bundle will be eligible for any future video releases that are considered advanced (under our 60-day policy), and NOT eligible for any videos released under the Cisco ACI (Basic) video bundle.